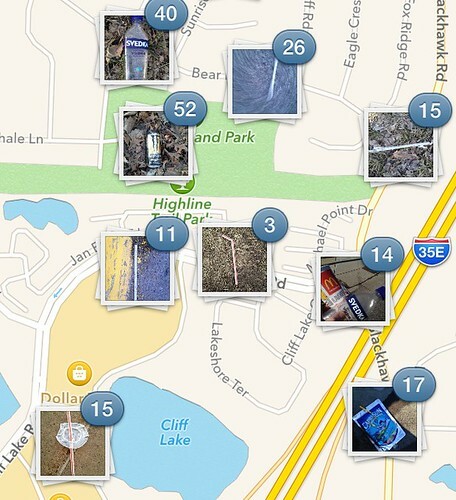 I made it to 2500 pieces of trash for Litterati earlier this week. I was aiming for 2500 by the time they reached 50,000, but I only made 2000 by that mark. I made 2500 by the time they hit 55,000. A miss, but still impressive, and it's good to have goals. 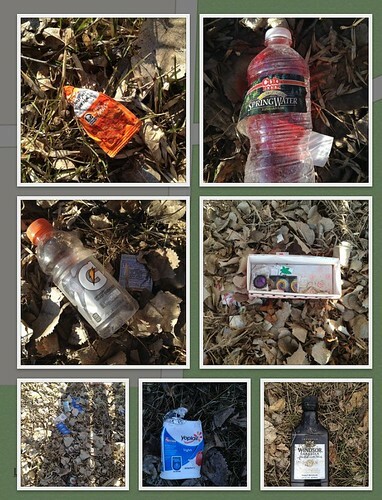 Here's some of what I've learned picking up trash. The dark corner in the neighborhood near the park that dead ends without much light gets a lot of condoms (and even a special condom collection decorated box), alcohol containers, smoking-related garbage, drug trash, and fast food trash. These all seem related and are refreshed on a regular basis. Near the movie theater is very dirty. It’s a bad idea to have a park next to a movie theater if you want to keep your park clean. You can make a difference in your neighborhood even cleaning every few days. You don’t have to pick an area to trash-free as you go; you can clean in iterations and get some exercise while an area gradually gets trash free. There’s a lot you can recycle if you really think about it: paper, cans (I separate them so I can sell them and use the proceeds for charity), plastic. Recycling tech is improving all the time. Small booze containers are a big source of trash: Svedka, hotel/airplane size. You learn things about the drinking habits in your neighborhood you might not rather know. There’s a disturbing amount of empty alcohol containers near interstate and state highway on ramps and off ramps. Instagram is not always up. That doesn’t mean you should just pick up trash and not take a picture. 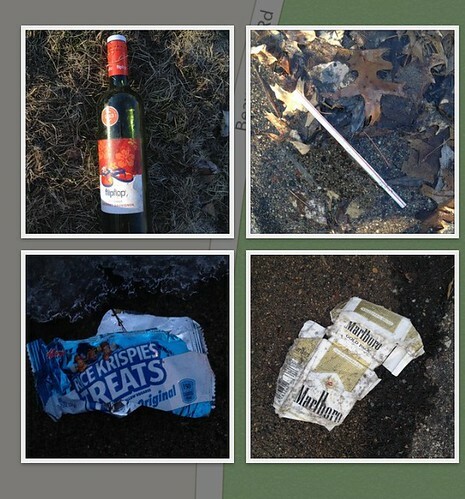 The park and ride gets strange trash: tires, booze, lots of cigarettes, lost gloves (things that fall out of cars), toilet paper, diapers – it seems to be a place to congregate and lose things. Cops will drive by to slowly check you out if you’re picking up trash at the park and ride or simply photographing a cigarette box or plastic cup in an unusual place. Neighbors will stop to watch and frown at you, wondering what you’re doing with a camera in the street. The world is suspicious of your trash collecting. Some people will stop to ask you what you’re doing and get excited about geotagging trash and want to know all the details. These people are usually a.) walking a dog or b.) holding someone’s hand. Perhaps happiness offsets suspicion. Perhaps cops should hold hands more often. Straws are everywhere. They seem almost as common as cigarette stubs. Be careful – some trash is medical waste. 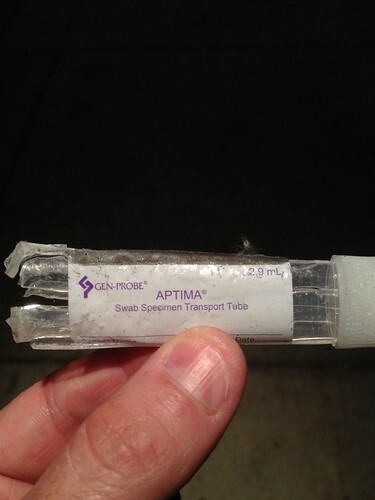 I picked up a plastic container in the dark only to discover it was for STD swaps: like HPV and Chlamydia. It was well baked and rained on, but I made sure to wash up right away anyway. If you don’t use gloves to pick trash, make sure you know where your closest hand washing facilities are. Bring a few wipes if you don’t have access to a place to wash your hands. Dirty hands are hard on your smart phone and can live small scratches and pits in the glass. Make sure to wash your smart phone as well as your hands after picking up trash. For some reason, a lot of people drink half a container of Gatorade/Powerade and then throw it out. This is a subject of consternation at our house. If the Gatorade is yellow, it might not be Gatorade. Biggest lesson here is don’t open bottles. You don’t know what’s in them. There are an inordinate number of gloves that are trash in MN. We are the land of 10,000 lost gloves. Snow removal results in many plastic brush bristles left behind. A green-minded northerner would do well to invent a better bristle or a more biodegradable bristle. People on Instagram will Like anything. Companies on Instagram will Like their product before realizing you’re tagging them for being waste producers. Taco Bell (in my neighborhood) produces a lot of trash. Marlboro produces a lot of trash. Svedka produces a lot of trash. You start to recognize patterns if you pick enough trash. You start to develop stories about the folks in your neighborhood and why some trash is so prevalent. Did I mention, there’s always new trash? Some trash is funny (greeting cards, homework, toy cars, Green Bay Packer helmet magnets). Some trash is not (dirty diapers, urine bombs, STD swabs, alcohol near the on ramp). I like to remove alcohol and smoke containers first so my neighbors/kids don’t have to look at it. This is a made up rationalization, but it adds purpose to collecting trash. Drainage ditches collect a lot of trash. Sometimes one picture of a lot of trash is ok.
It’s not that hard to just take a small bag with you if you walk a lot to the grocery store, movies, coffee, and ice cream, and just pick a few things. Wash your hands at your destination. Snow leaves a lot of trash in the spring, but it’s also a good time to pick it up because there are no weeds, no stickers/pricklies, and best of all no ticks or mosquitos. I learned what Beezing is because of picking up trash [http://gothamist.com/2014/04/25/beezin_aint_e-zee_a_minty_recovery.php#.]. It could be a fake meme, but that doesn’t mean I don’t have a lot of Burt’s Bee’s containers in my neighborhood. Small handouts/magnets might seem like a good business idea (in mailboxes/doors), but they’re incredibly bad for the environment (I’ll end up tagging the same advert many times). 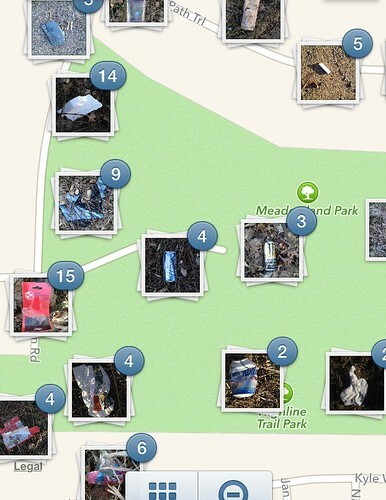 There are a lot of people interested in picking up trash – there’s a good online community. And if I’m picking up trash along the paths near my house, some people will opine that they’ll bring a bag to collect trash on their next walk. It has a positive impact. There are SO many sources/businesses that produce disposable waste – obvious when you think about it, but it’s surprising when faced with a street corner containing dozens, if not hundreds, of brands. You end up looking at trash, your phone, and the ground a lot more than you did before you started Litterati. This isn’t good if you like to bicycle a lot and it’s a problem when there are trees. Wear a hat if you’re collecting trash in the trees for some added protection. Bleeding once because you were tagging trash is more than enough. 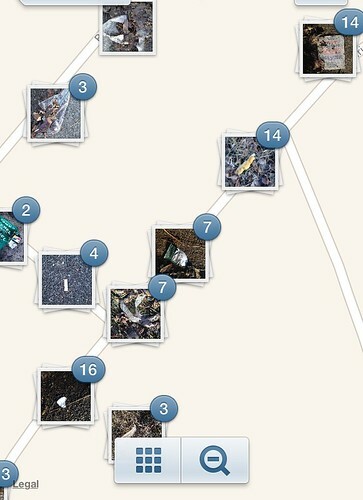 There are obvious places that would benefit from a trash can based on the geotagging of the trash in my neighborhood. There are obvious companies that would benefit from greener packaging.The dark corner in the neighborhood near the park that dead ends without much light gets a lot of condoms (and even a special condom collection decorated box), alcohol containers, smoking-related garbage, drug trash, and fast food trash. These all seem related and are refreshed on a regular basis. There are obvious companies that would benefit from greener packaging.